Handmade for a man in the 1950’s, or maybe even the Forties, but I’ll make it my own. Neat little way of unbuttoning the neckline so that it can be slipped on. The most fabulous soft cotton, due to many washings and wearings. LOVE the french sailors print!!!!!!! And, of course, a chest pocket on the left. There is damage under one arm, so I will be taking the sleeves off and making it a cap sleeve tunic. Don’t mind – as an alteration, that’s probably better. Love it when I find unusual things like this. More coming . . . . . .
A fitted (the best) Western-style shirt in cotton blend with a floral wallpaper stripe and a true vintage paisley scarf, maybe both from “Monkey Ward” (see the shirt label and investigate the nickname online – fun). Again in my size, though the blouse size must have been for a girl at that time. Unusual finds per their fabulous condition. I’ll enjoy wearing them – very much perfect examples of the fashion era when they were made. Not always the most exciting things to find, but I am always thrilled because true vintage wardrobes cannot be built without them. What will you wear with that great 1940’s skirt or pair of slacks? What blouse will be just right under the beautiful skirt suit? I also love these garments because of the fabric and tailoring. A hand-knitted sweater from back in the day is always a great find because they’re RARE and much more nicely crafted than machine-knit mass-produced clothing in the stores today. I love the Forties/Fifties style of this one with gathered shoulders and ribbed cuffs, fitted waist and a scalloped boat neck. The short-sleeved shirt is a well-tailored cotton version, so common during the 1950’s and early 1960’s for everyday wear. The pale pastel palette will be just right with skirts, shorts, jeans and summer whites. I hit the separates jackpot which I’ll continue to show you tomorrow. 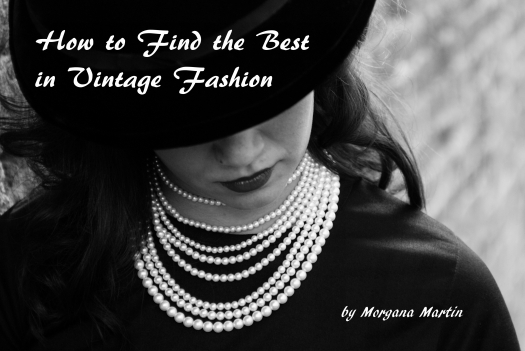 Stay tuned . . . . . . . . . . . . . . . . . . . .
A REALLY CUTE BLOUSE MYSTERY – VINTAGE OR RETRO? I just loved the mid-century post-war vibe of this shirt as soon as I saw it. The cotton fabric is in a print very faithful to that time-frame, and some of the design details are, too. But, there’s evidence of a label which doesn’t look like it was an old one (?). All I have to go by is the remnant left when it was cut out. I’m not often stumped – but it gets trickier . . . . . . . . .
Somewhere along the line this shirt was altered and re-styled, probably to make it smaller. I love the piping accents that may have been added. The front probably used to button, but was closed to make a pull-over style. At the end of the day, I can’t definitely say what the true age of this garment is or be really clear be clear about it’s history. However, it’s very fun and fits me! What could be better? I’ll choose to believe that it’s 55 years old and enjoy. You just never know . . . . . . . . . . . . . . . . . . . . . . . . . . . . . . . . . . . . . . . .